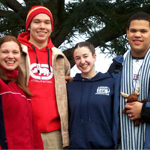 In Spring 2006 Challenge Team UK visited 44 schools and ten youth groups, making 72 presentations. In all, over 10,000 pupils witnessed a presentation. Areas of the country where schools were visited ranged from Torquay to Gravesend, including Sussex, Hants and the Isle of Wight, from outer London to Bath and Glos. and from Herefordshire, Worcs., Birmingham and Oxfordshire to Cambs., Leics., Notts. and Derby. Summer 2006 also saw the Team make their first visit to Scotland, presenting at eight schools, where they were well received. 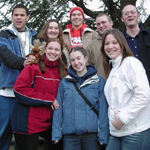 During October 2006 a Team toured Manchester and the North West, where they did 38 presentations at 16 venues across a 3 week period to more than 5000 teenagers. Could you be our next team member? Challenge Team UK is a Charitable Trust No.1058747. All content Copyright 2016 Challenge Team UK.